“Buttoned-Up” Chunky Necklace: Tell it Like it Used to Be With a Chunky Jewelry Necklace Sporting Remarkable Examples of Bakelite and Vintage Plastic Buttons in Black and Off White. The Clusters of Vintage Beads and Buttons are Securely Hand Sewn to a Thick Braided Cord With Handmade Frog Closure. 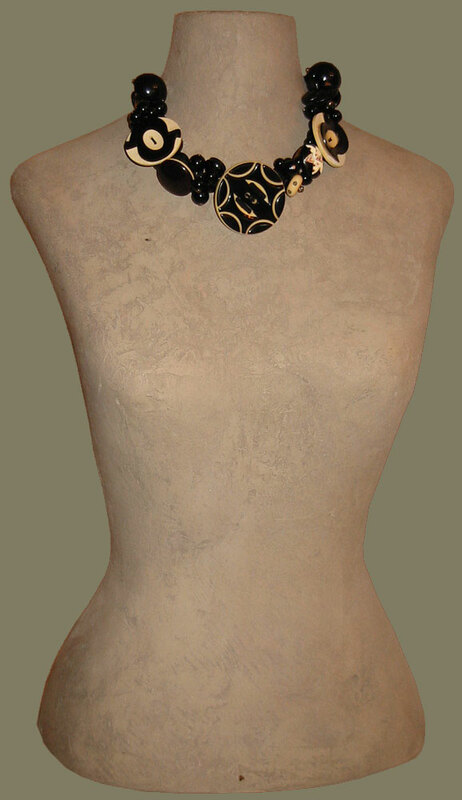 This Fashion Accessories Necklace is a Conversation Piece and a Button Collection All in One. Another Artisanawear Designer Necklace of Reclaimed and Recycled Treasures. A Carol Tate Original Design.